Juventus are moving ever closer to winning a record 8th consecutive Scudetto and are now 18 points clear of second placed Napoli with only 11 games to play in the 2018/19 season. On Friday, the Old Lady who are preparing for their crucial UEFA Champions League return leg at home to Atletico Madrid, defeated Udinese 4-1 at the Allianz Stadium. 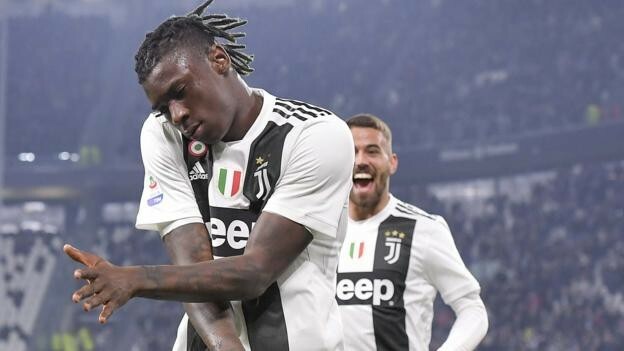 On a day that Massimiliano Allegri rested several players, it was teenager Moise Kean who grabbed the headlines with his first brace in the Serie A. Emre Can added a third from the spot while Blaise Matuidi scored their fourth. Kevin Lasagna grabbed Udinese’s consolation late on in the game but it was all they could smile about as Juve put them to the sword. Juve who are still unbeaten this season now move to 75 points for the season, having won 24 and drawn only three of their 27 games. For Napoli, they required a late Lorenzo Insigne equalizer to draw 1-1 away to Sassuolo on Sunday evening. After a goalless first half, the home side took the lead on 52 minutes through Domenico Berardi and despite wave after wave of attacks, Napoli were only good for a point in the end. Carlo Anchelloti’s side are now 18 points behind Juve on 57 and their hopes of winning a first scudetto in 30 years are all but shuttered. In the race for Champions League football, AC and Inter Milan tightened their grip onto the issue with respective victories this weekend. AC scrapped to a 2-1 win over Chievo on Saturday while Inter required two second half goals to take care of SPAL the following day. With Roma only in action on Monday, Atalanta and Torino moved level with the capital sides on 44 points apiece. Atalanta were 2-1 winners away to Sampdoria while Andrea Belloti struck twice as Torino came from a goal down to defeat Frosinone 2-1 at the Stadio Benito Stirpe. Elsewhere, there were also victories for Parma and Bologna. Parma edged Genoa 1-0 on Saturday while Bologna overcame Cagliari 2-0 on Sunday afternoon. 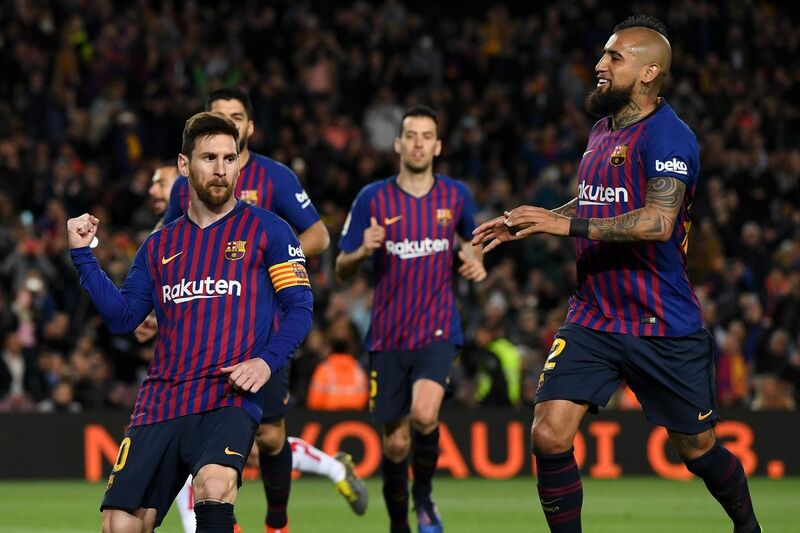 In the Spanish La Liga, Barcelona maintained their 7 point lead atop the standings thanks to a hard fought 3-1 win over Rayo Vallecano at the Camp Nou. Raul De Tomas put the visitor 1-0 up inside the opening quarter of the game but Gerard Pique equalized 7 minutes to half time to ensure Ernesto Valverde’s side go into the break level. In the second half, Lionel Messi scored from the spot and Luis Suarez added a third later to see Barca win 3-1. The three points see the defending champions move onto 63 points for the season, 7 ahead of second placed Atletico with 11 rounds to play. For Atletico, they were 1-0 winners at home to Leganes on the same day. Saul Nigguez scored the only goal of the game, five minutes into the second half to see Diego Simone’s side move to 56 points. Real Madrid on the other hand returned to winning ways thanks to a 4-1 come-back victory away to Real Valladolid. Santiago Solari’s side who were winless in their last two in all competitions, trailed early via an Anuar Tuhami goal on 29 minutes. However, they responded with four of their own as Raphael Verane, Karim Benzema *2 and Luka Modric all struck, despite having Casemiro sent-off in the 80th minute. Real now have 51 points, 5 and 12 behind Atletico and Barcelona respectively. In the battle for the fourth and final Champions League spot, Getafe registered their third win on the trot, defeating Huesca 2-1, Deportivo Alaves were held to a 1-1 draw by Eiber while the trio of Sevilla, Valencia and Real Betis were also victorious. Sevilla beat Real Sociedad 5-2 at the Ramon Sanchez Pizjuan, Valencia were 3-2 winners away to Girona while Betis required a Jese 80th minute goal in the 1-0 win at lowly Celta Vigo. Getafe are on 45 points, Alaves 41, Sevilla 40 while Valencia and Betis have 39 each. Elsewhere, only Villareal who defeated Levante 2-0 away from home, were victorious in the bottom half of La Liga. In France, Lille closed the gap on leaders PSG to 14 points, thanks to a 1-0 victory away to 9 man-Saint Etienne on Sunday afternoon. 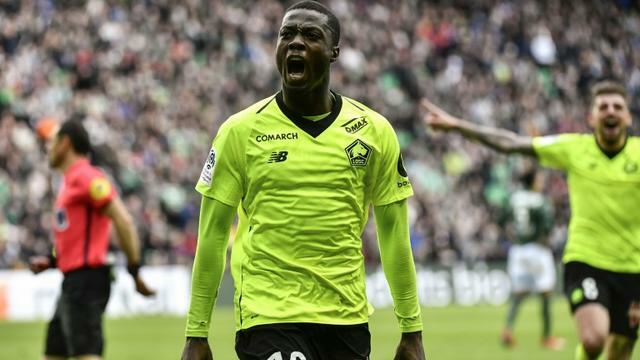 Nicolas Pepe scored the only goal three minutes from time before an additional time comeo that saw Mathieu Debuchy and Waibi Khazri sent off for the home side. Lille now move onto 57 points, 14 behind PSG (71) who play their game away to Dijon on Tuesday. In the battle for the third and final Champions League spot, Olympique Lyon drew while Marseille did themselves favours, registering victory. Lyon who are now third on 50 points squandered a 2-0 lead thanks to Moussa Dembele’s first half brace to draw 2-2 away to Strasbourg on Saturday while Mario Balloteli continued his fine run of form, scoring the winner in Marseille’s 1-0 win over Nice the following day. .
Monaco’s bid to avoid the drop saw them draw 1-1 at home to Bordeaux on Saturday. Leandro Jerdim’s men took the lead through Radamel Falcao but Bordeaux equalized in the second half via a Jemmie Briand penalty to ensure the game ends in a draw. The draw sees Monaco maintain their 6 point caution away from the drop and they were helped by the fact that none of Dijon, Caen and Guingamp, who are below them, registered victories. Elsewhere, Rennes, Toulouse and Amiens were also victors in their respective fixtures. Rennes were 3-1 winners at home to Caen, Toulouse beat Guingamp 1-0 while Amiens overcame Nimes 2-1. 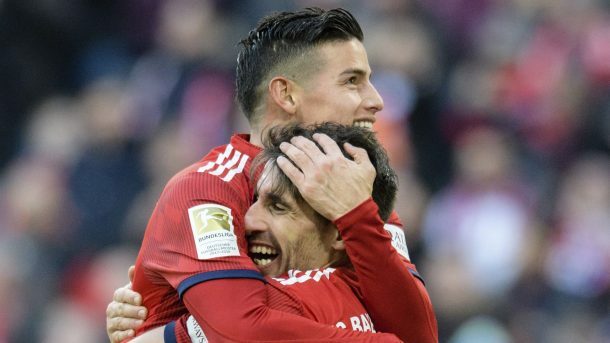 In the Germany Bundesliga, Bayern Munich moved top of the standings on goal difference, thanks to a 6-0 demolition of Wolfsburg at the Allianz Arena. Star-striker Robert Lewandowski helped himself to a brace to become the highest scoring none German in the Bundesliga while Serge Gnabry, Joshua Kimmich, Thomas Muller and James Rodriguez each scored once. Victory sees Bayern move top of the League for the first time this season, level on points with Borussia Dortmund but with Nico Kovac’s side having a better goal difference. For Dortmund, they returned to winning ways thanks to a 3-1 win at home to relegation bound Stuttgart. AFter a scoreless first half, Marco Rues put Dortmund 1-0 up on 62 minutes but that advantage was wiped out by Marc Kempf 9 minutes later. However, the home side who lost 2-1 away to Augsburg last weekend, would not be denied, seeing Paco Alcacer and Christian Pulisic score two late goals to win the encounter. Dortmund are now second, level on points with Bayern (57). In the battle for third placed, Leipzig were held to a frustrating 0-0 draw at home to Augsburg while Borussia Monchengladbach defeated Mainz 1-0 thanks to Nico Elvedi’s 63rd minute strike. With Frankfurt only in action on Monday, Beyer Leverkusen moved into 5th on the standings, defeating Hannover 3-2 away from home. Leverkusen raced into a 2-0 lead before half time with Kevin Volland scoring the goals for them. However, Jonathas and Mitchell Weiser struck for the home side to level matters before 19 year old-Kai Havertz won the game for Peter Bosz’s side three minutes from time. Elsewhere, Hoffenheim, Bremen and Freiburg were also victorious last weekend. Hoffenheim scrapped to a 2-1 victory over Nuremberg, Bremen were 4-2 winners at home to Schalke 04 while Freiburg defeated Hertha Berlin 2-1.